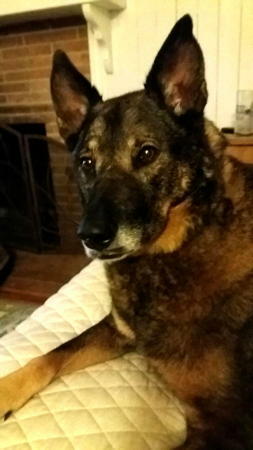 Esther is a 9 year old sable female. She came from a Sacramento area shelter and we know little about her history. We were told that she belonged to a homeless person sometime in her past and became a favorite of one of the staff members at the shelter. Esther is a little on the heavy side, so she was fed well wherever she'd been. This is one sweet, low energy girl. She appears housebroken, walks fairly well on a leash, and ignores the cats in her foster home. 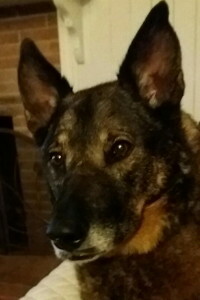 She met the other male German Shepherd in the foster home easily. More to follow as we get to know Esther better. Regular exercise and proper diet will be needed for this nice, easy girl.